There are a number of subdivisions with new construction throughout all of Louisville, at least 17 of those subdivisions are in the 40245 zip code. Finding new homes for sale in East Louisville can be easier when broken down by subdivisions. Finding out which subdivsion fits your needs and location you prefer to live in first can save time. 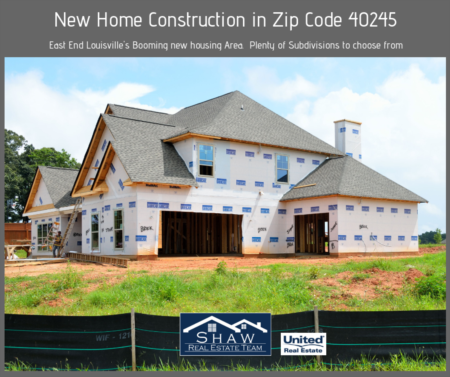 Here's a list of some of the other Subdivisions in Louisville's East End zip code 40245 with beautiful new construction homes available. Each link below has a map feature that you can use to locate each subdivision and view homes and lots/ land currently for sale. One particular subdivision that has received a lot of press lately is Catalpa Farms, home of the 2018 Louisville Homearama. There's 8 homes currently on the market and 32 lots for sale in Catalpa Farms. There's many style lots availble, from walkouts with private wooded back yard to flat ones. You will need to enter through Shakes Run subdivision to get to Catalpa Farms for now. There are plans to have an entrance added to Catalpa Farms that will come in off Clark Station Rd. This is expected to happen within the year hopefully, according to Mike Jones, the developer. Another excellent subdivision to look at lots/land for building is Persimmon Ridge. The large lot sizes, beautiful golf course and club house makes you feel like your outside of Jefferson County. Persimmon Ridge isn't a new subdivision, it has homes that date back to 1990. There is currently a new section with plenty of lots ready for development. The average lot size is .50/ acre, which is uncommon for Eastern Jefferson County. Most subdivison lots in Eastern Jefferson county will range from .20-.30 / an acre. Being only minutes from the Old Herny Exit off of the Gene Snyder makes Persimmon Ridge a great choice. If you have been looking at new homes in East End Louisville, you've most likely come across Floyds Fork Estates. Located off Aiken Rd. near the Gene Snyder, this new subdivision by Fischer Homes has a lot to offer. With 8 different models, all different styles and sizes, nearly anybody could find a home plan to fit their needs. Floyds Fork Estates has their own on site sales agent, so we recommend taking your Realtor with you to your appointment. If you need to schedule an appointment and have a Realtor represent you, please contact us. Do I Need A Realtor To Purchase New Construction? Without a doubt, we recommend hiring a Realtor. Not only is it smart to have representation, but it doesn't cost you a thing! That right, the seller of the home pays all Realtor comissions. (unless another agreement is made between the buyer and the seller.) If you choose to use a Realtor, It's important to find/hire one before approaching a builder. Realtor's are a huge benefit to the buyer when looking to purchase new construction homes, as there's still plenty of negotiation done between the buyers and the builder, or builder's own realtor or agent. Keep in mind that the builder's agent will always have the builder's best interest in mind, you should have someone with experience with your's. Our next up coming blogs in our series on New Construction in East End Louisville 40245 will feature some of the New Homes for sale in 40245, as we plan to tour some of the new developments and gain information about the areas.